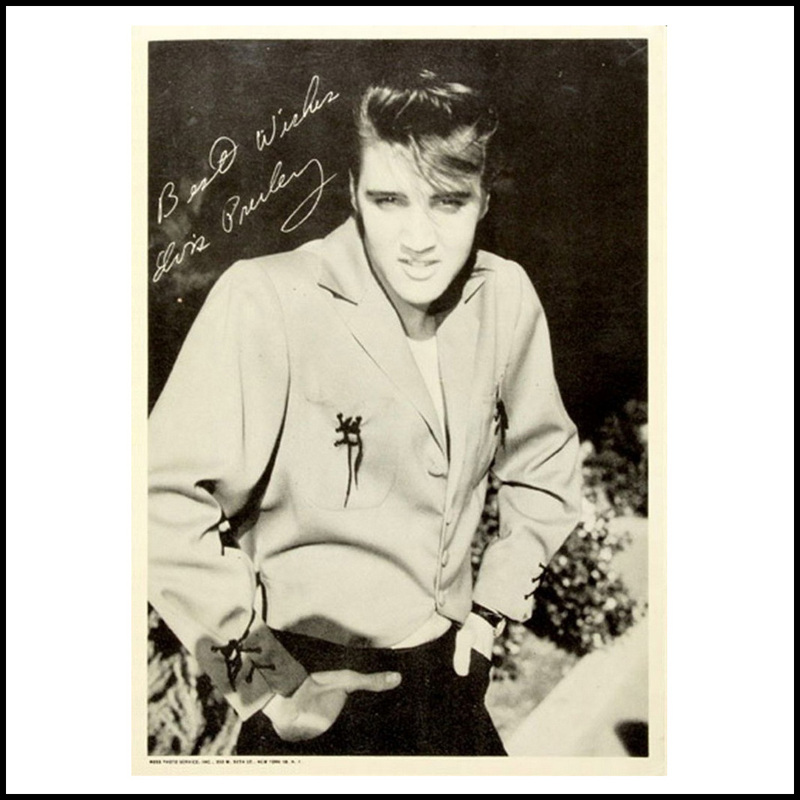 By late 1956, the Elvis Presley merchandise train went through the sound barrier. Just about every thinkable item that carried his face sold like wildfire. 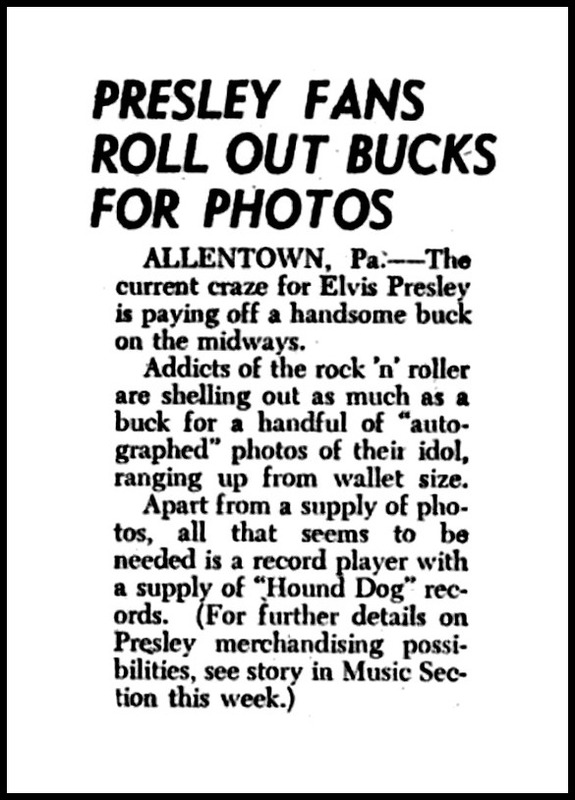 But, right from the start of his career, no items were more in demand than Elvis Presey Photos. 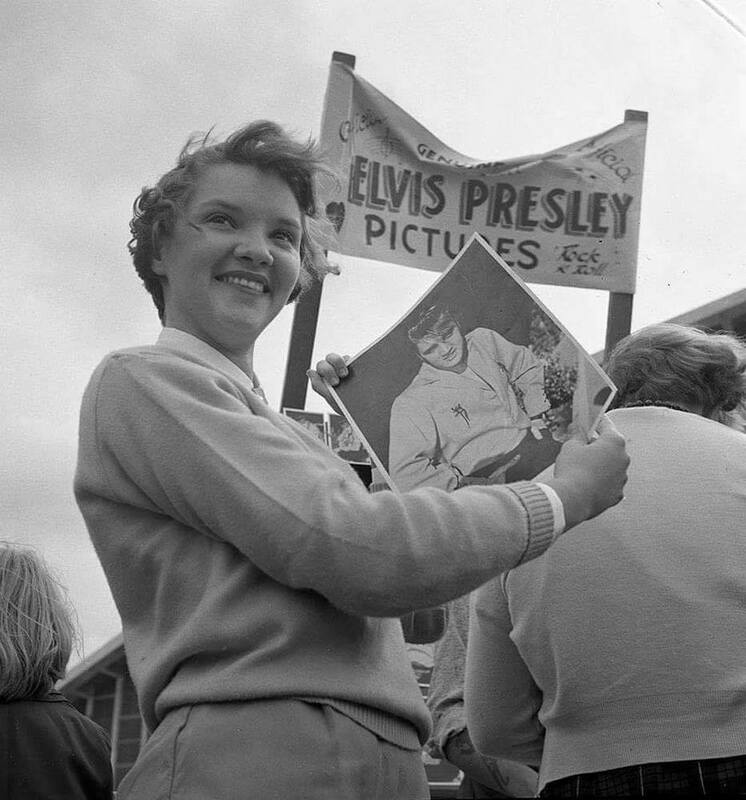 Elvis’ manager was very happy to oblige and several different companies were hired to produce the tons of photos that were sold at concerts and through mail-order. 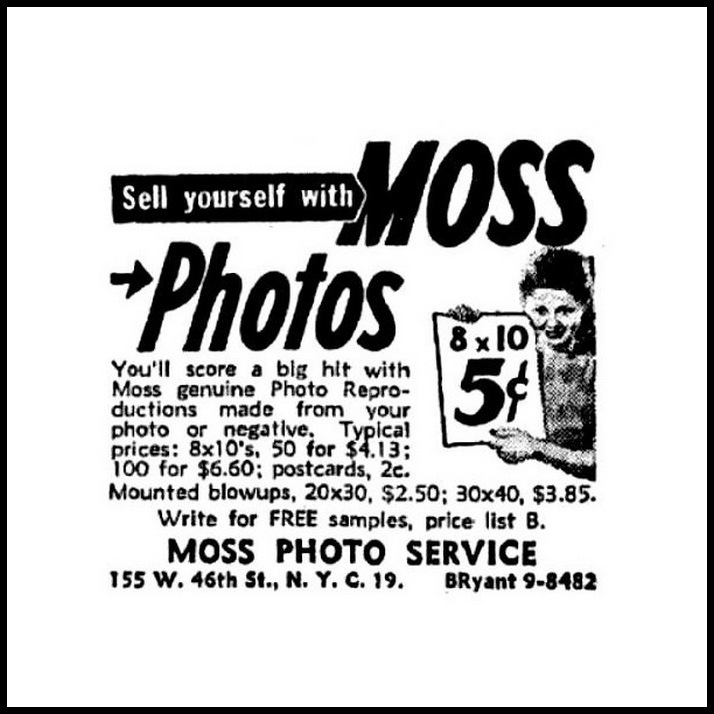 One such company was MOSS PHOTO SERVICE. 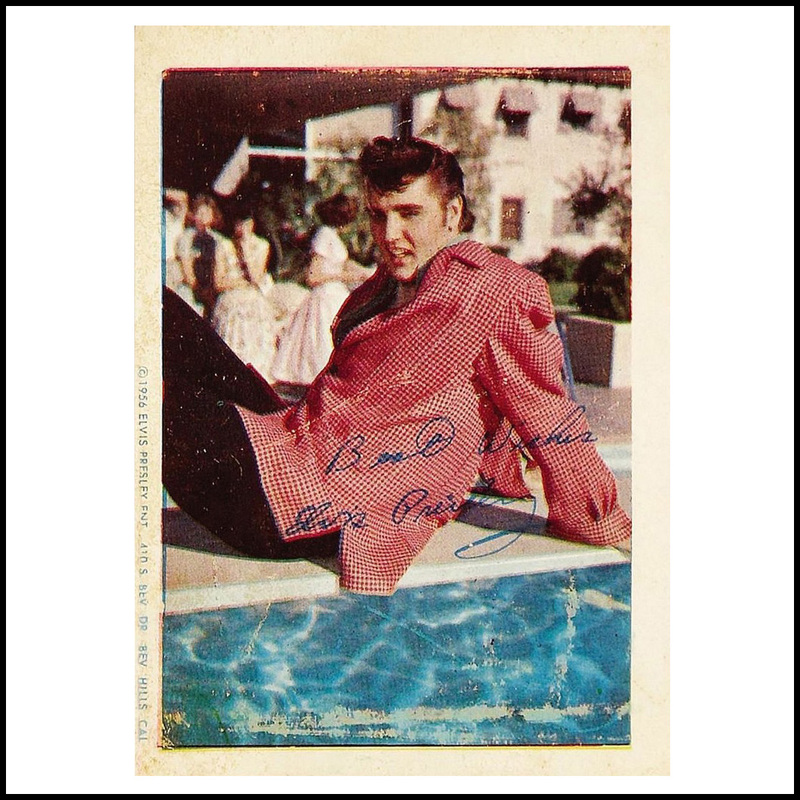 During the 1950’s, RCA and Parker have hired Moss for other Elvis photo projects, but this article is all about the four photos, commonly known as THE MOSS PHOTOS, taken in April 1956 when Elvis and the boys played the New Frontier Hotel in Las Vegas for two weeks. The Moss Company used to advertise their services in magazines and newspapers. To the right we see examples of two such ads. The first is from 1946, the second from 1955. It’s interesting to see that during this ten year period the price for one hundred 8×10 photos has not gone up, on the contrary: the price dropped from $ 6.60 to $ 6.50. You will notice that, when comparing the Moss photos presented in this article, their true difference in size is hardly noticeable since all photos are presented in an identical size for better viewing pleasure. To give you an impression of how these photos actually differ in size, here is a collage of all formats in their actual size when placed next to eachother. 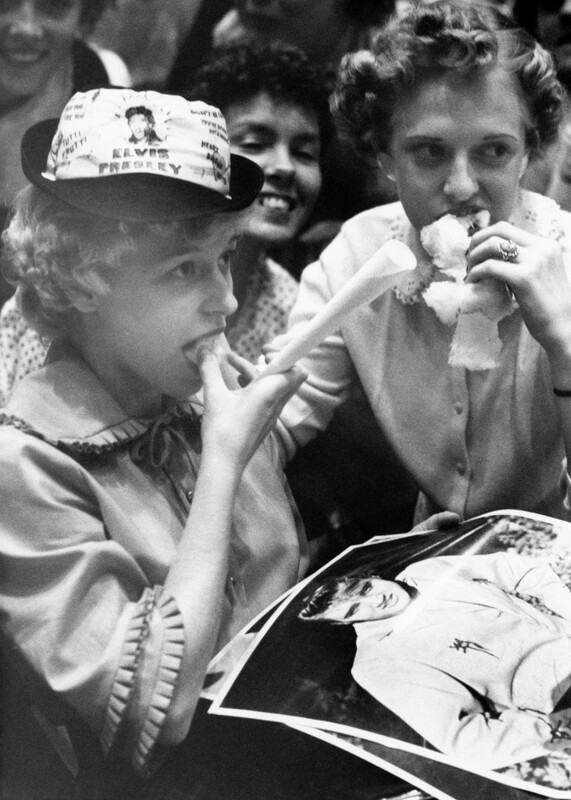 Here we have a beautiful photo of an EPE-hat-wearing Texas girl (attendeding the show at the Houston Coliseum) who had just treated herself to a couple of Elvis Photos. In the large 11×14 size. Of course. 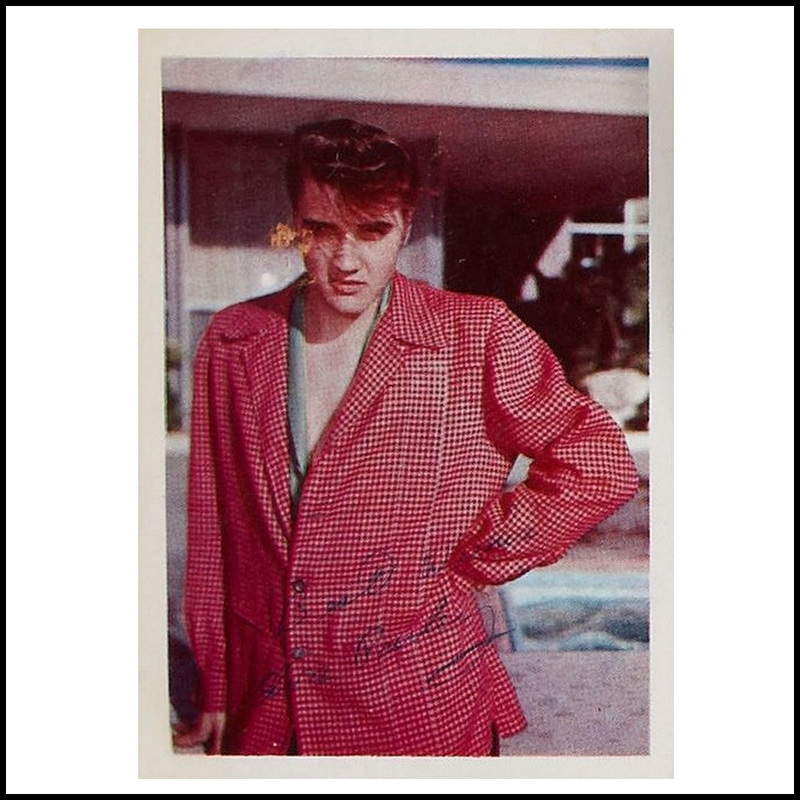 As mentioned in the short article below, Elvis photos sold like hot cakes. Above we see the 5 x 7 version, in two color variations. Notice that the original image has been cropped differently for these variations. Also the signature is not in the same place. 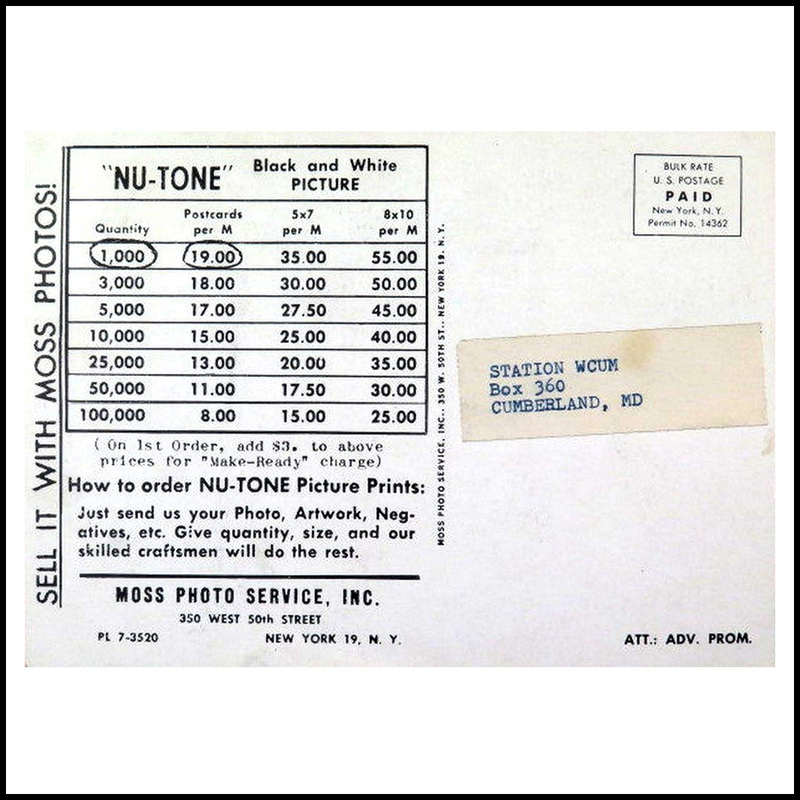 The Moss reference appears (rather dominantly) in the right border of the color photo while it is printed (hardly readable) at the bottom of the b&w variation. The 8 x 10 version is pictured to the right. The original image is once again cropped differently when compared to the 5 x 7 variations. The signature has a much less prominent role because of its smaller size. Below we see two variations of the 11 x 14 version. The regular photo pretty much resembles the 8 x 10 variation with the exception that it is a tiny bit less cropped. The signature and the Moss reference are also in nearly the exact same spot. 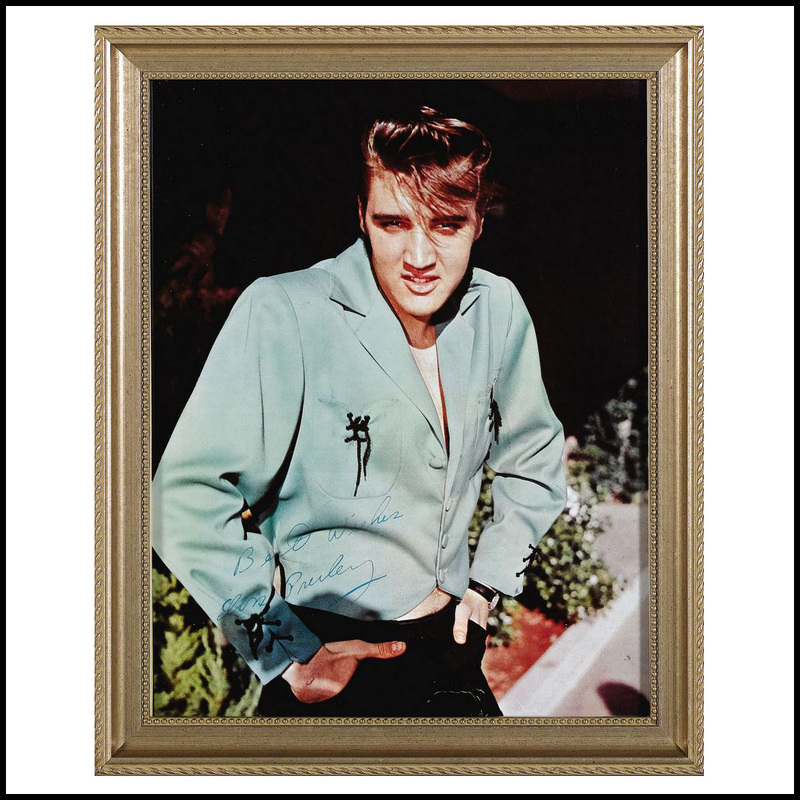 This 11 x 14 photo was also available in a plastic frame which brought its total size to 13 x 16 inch. This item is the rarest of the Moss collection, it recently sold online for $ 540. The Moss photos came in different sizes, and in different colors. 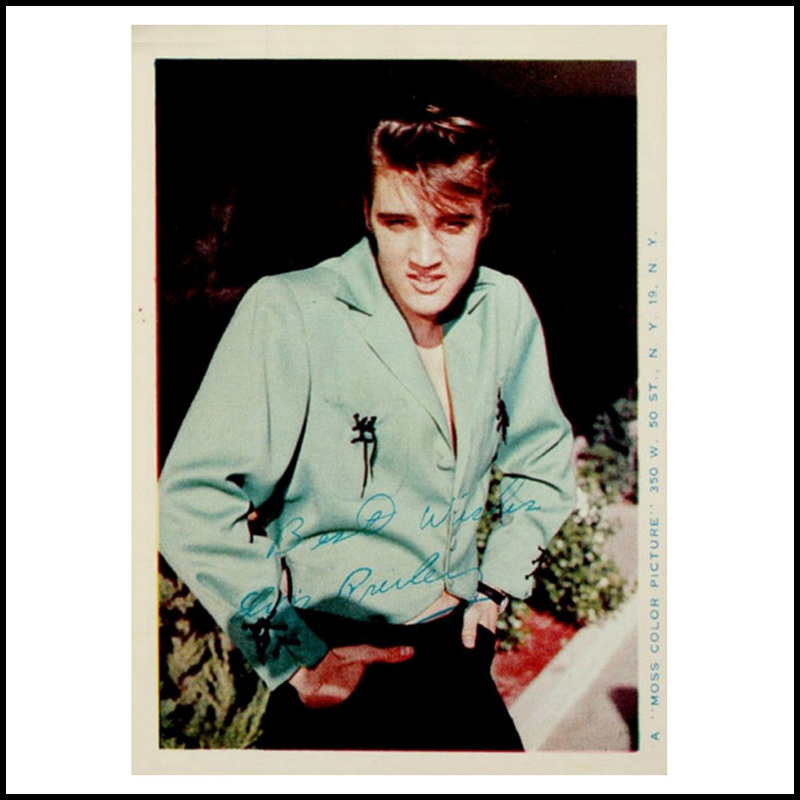 But (as shown above) also same-sized photos came in different variations: the signature and the Moss reference appear in different positions on these photos. Next to this, copies without the Moss reference also exist. To make things even more complicated for the collector, the back of these photos also show a wide array of variations. 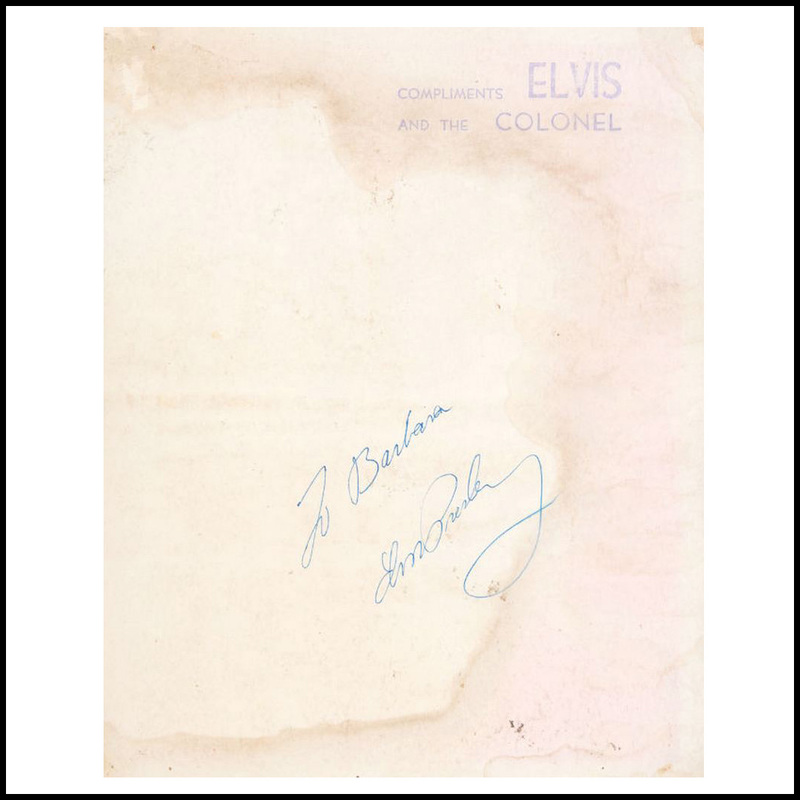 Some backcovers are blank, while others have a stamp. And as can be seen to the right, some photos even have two stamps. 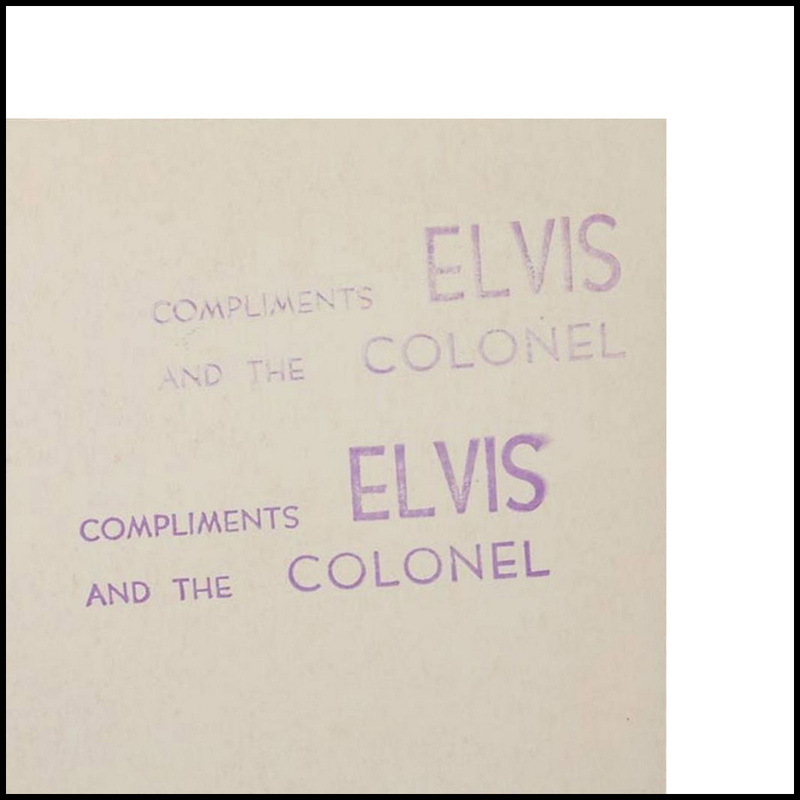 When looking at the compliments ELVIS and the COLONEL stamp (that is not printed on the photo but was added manually later), one cannot help but realise that this stamp was one of The Colonel’s tricks to ‘move himself into the picture’. No other manager in the history of entertainment has purposely played such a prominent role during the career of his client. 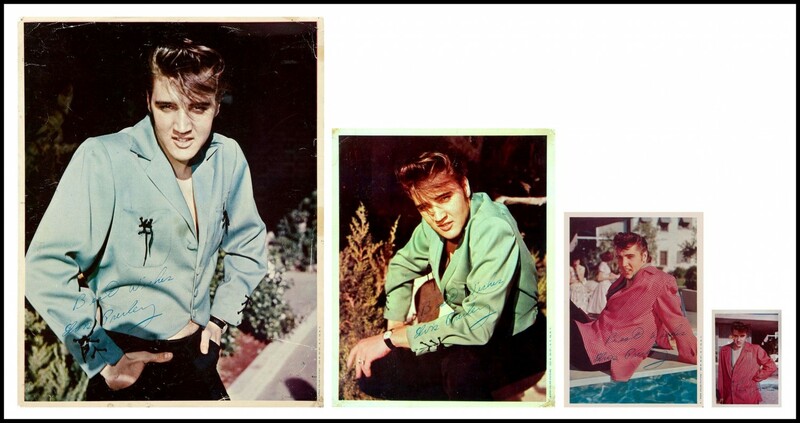 Below we see the second Elvis pose that was used for the Moss photos. 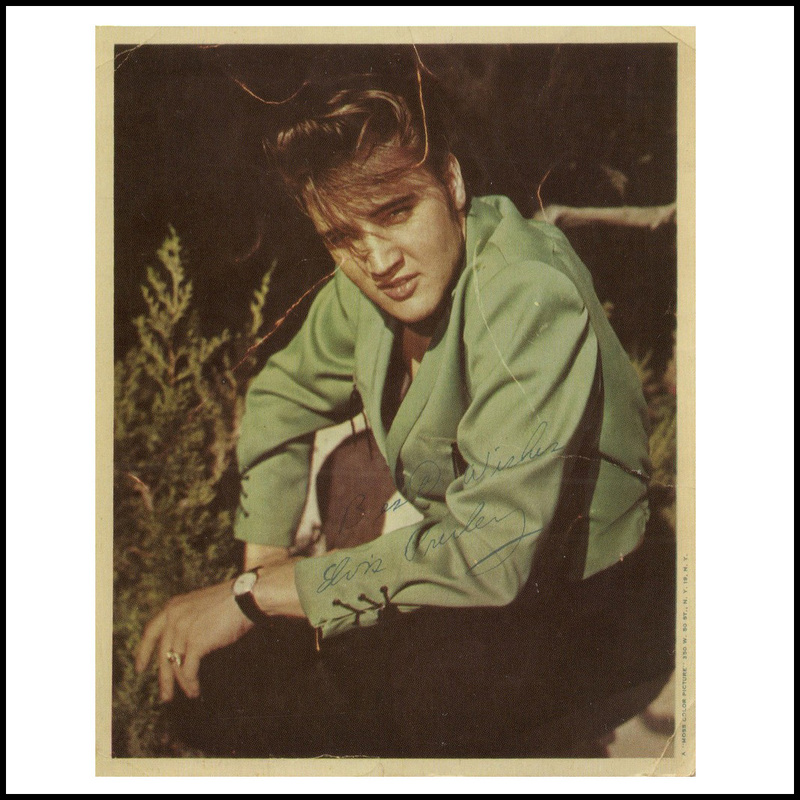 Pictured are the front and back of the 8 x 10 version. This image was available in all four size variations. And here we have Elvis pose number three. 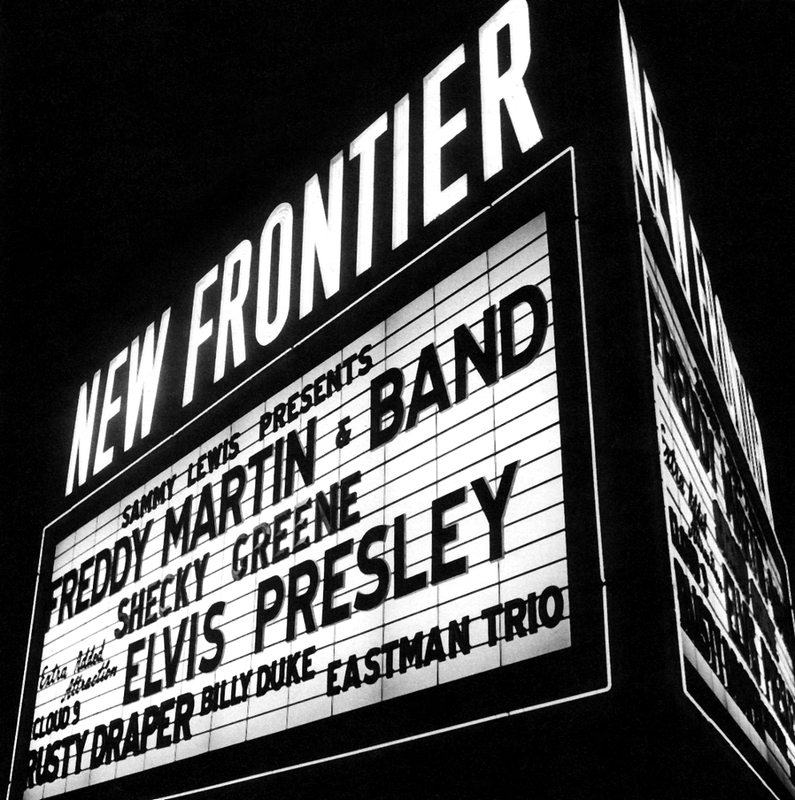 This image was available in all four sizes. Pictured to the right is the size that is commonly referred to as wallet-size, 2.5 x 3.5. Notice that the border does not contain the Moss reference. 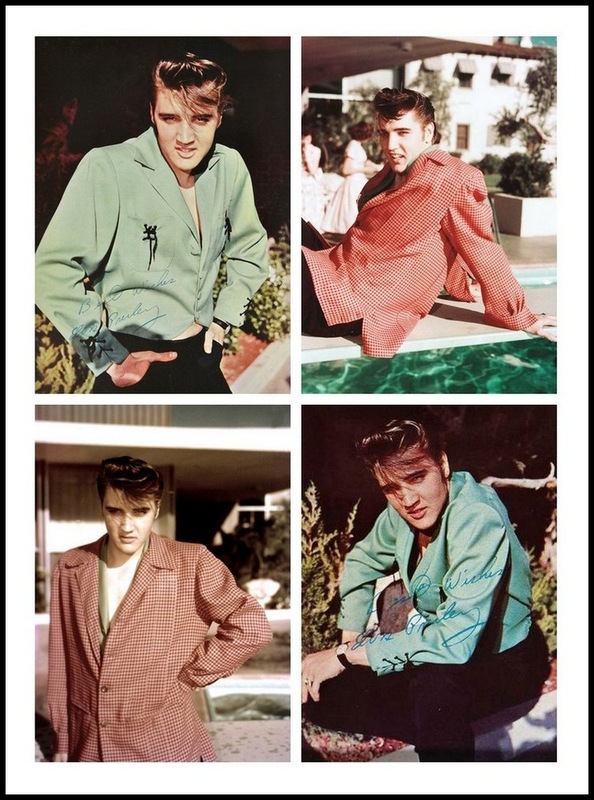 The photos of Elvis in his green jacket might have been printed in a larger quantity, or maybe they sold far better than the photos in which Elvis is wearing a pink jacket. 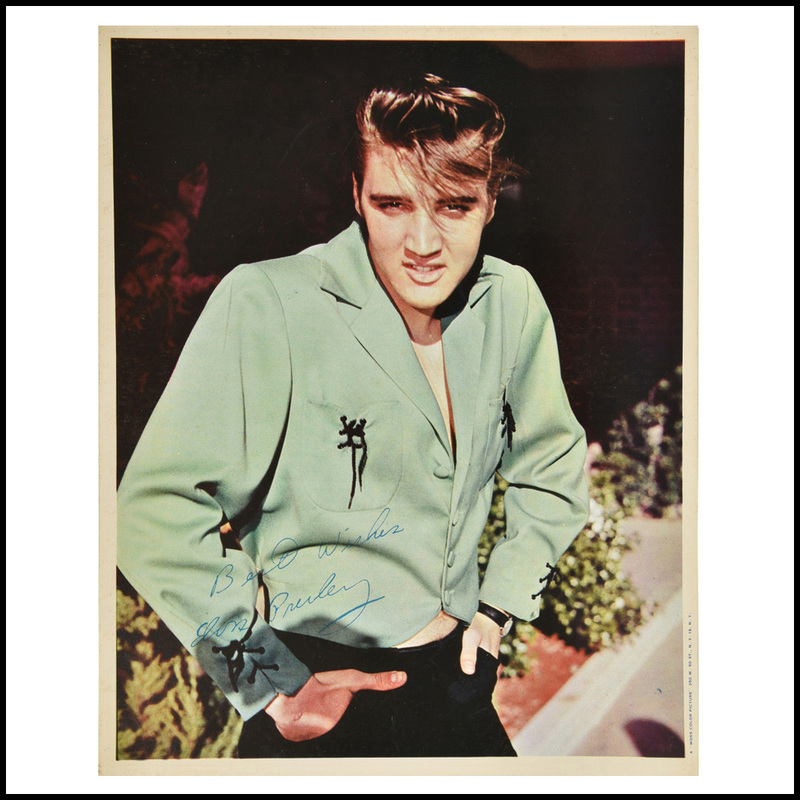 Fact however is that the green jacket photos are very rare nowadays while the pink jacket photos are nearly impossible to find. The fourth and final image in the Moss series. This image was, just like the other three images, available in all four sizes. What we have here are three different variations of the 5 x 7 color version. We see a good quality photo. The Moss reference is printed on the right border. Here we have a photo for which a less cropped original image was used, but the overall quality of this photo is very lousy. The most interesting thing however is that this photo does not contain the Moss reference but the copyright logo of Elvis Presley Enterprises. This photo contains the least cropped original image. There is no mention of either Moss or EPE on the borders. This is the 2.5 x 3.5 version of this photo. As was the case with most photos in this article, also this photo has been cropped differently. 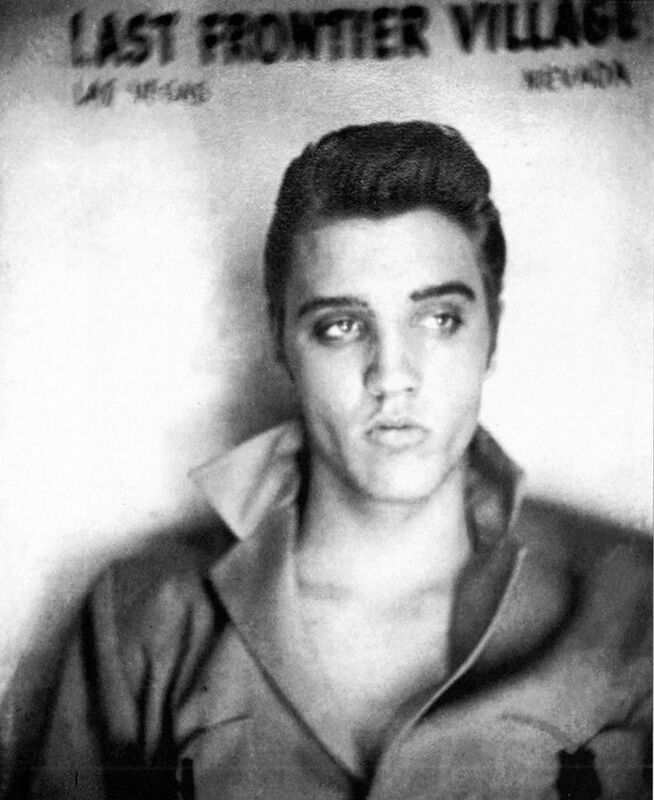 It really makes you wonder why Moss did not simply reproduce their earlier work by the time they received a new order for more Elvis Presley photos. The photo to the right here is of great quality, especially for a wallet-sized photo. But the quality of some of their other prints was very much below standard. Even though the fans did not seem to care. Here we have a very interesting item. This is not just the 5 x 7 b&w variation of this image. 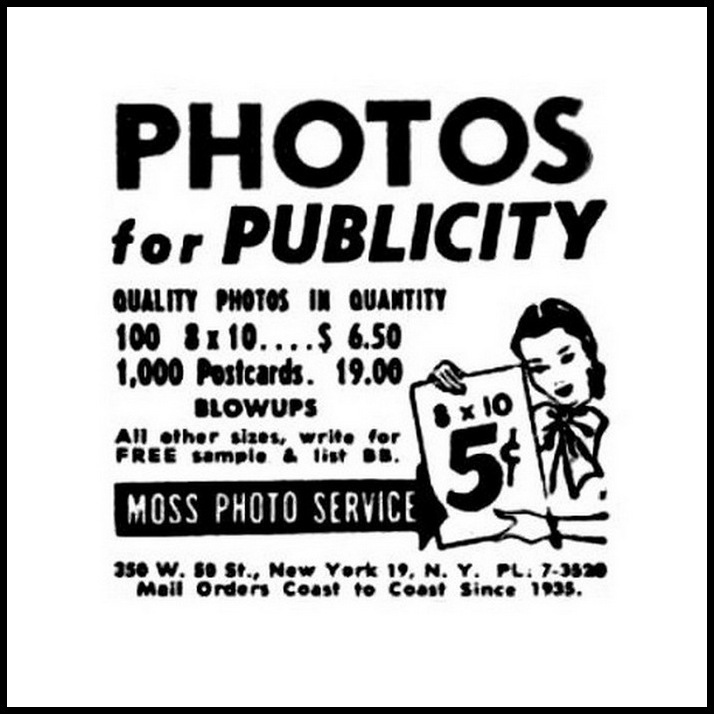 This is actually a PROMOTIONAL POSTCARD as used by Moss to bring their services under the attention of potential clients. On the back of the postcard we can see how incredibly cheap it was to have these kind of items manufactured. The most expensive deal was not even $ 0.02 for a postcard and $ 0.05 for a glossy 8 x 10 photo. Notice also that girls in the background have been photoshopped out of this postcard. THANKS to GER RIJFF, without whom this article would never have existed. 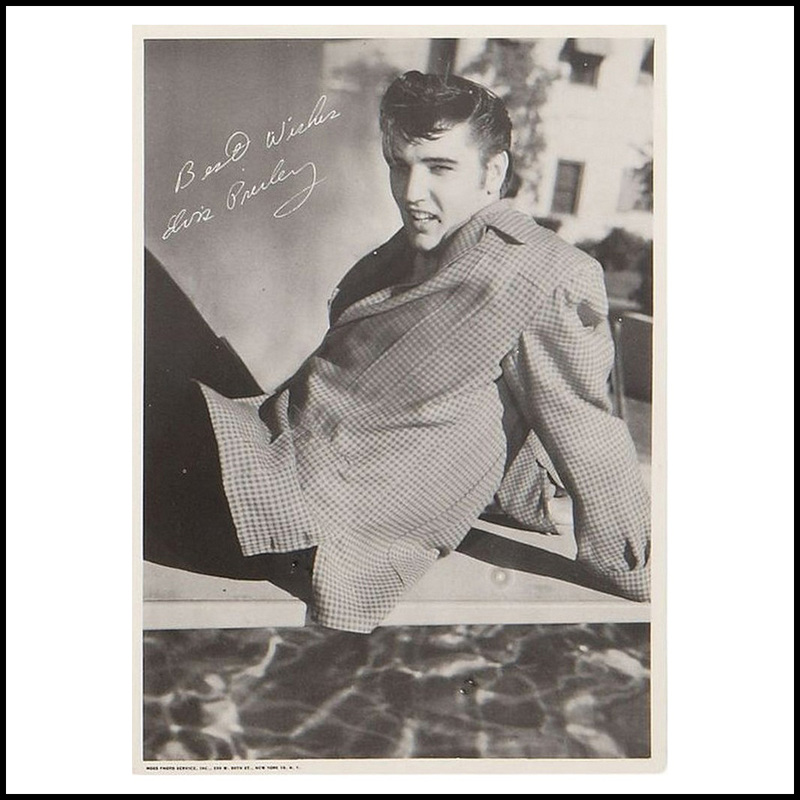 black & white 8x10s are extremely kool and rare. Bring on part 2, Mr Detective! What can I say? The Koolness continues! Thanks! Very cool indeed. 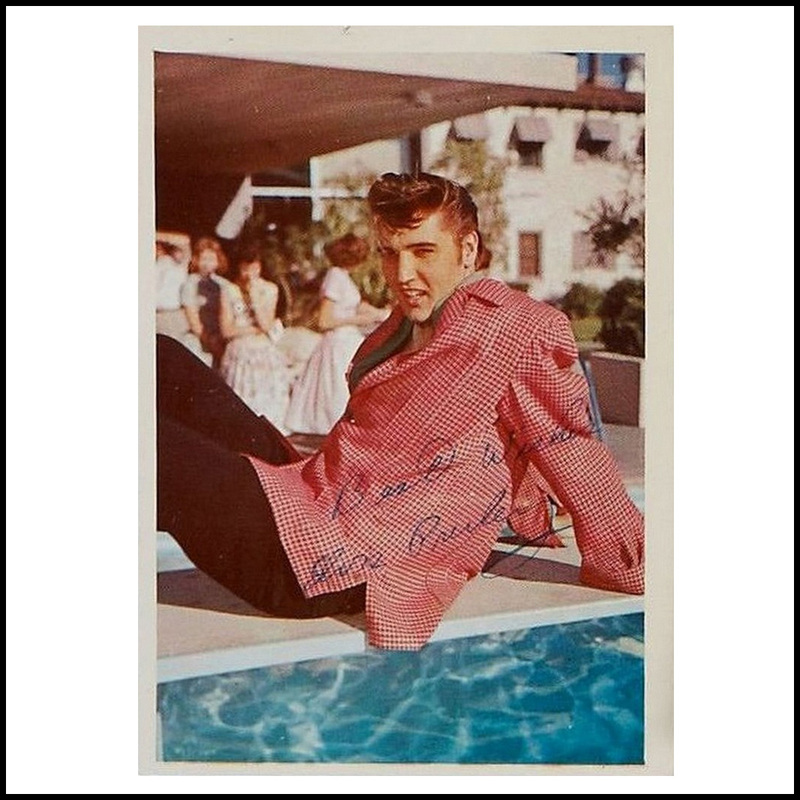 The picture of Elvis by the pool has been one of my favourite Elvis pics since I first saw it in a book by Lodewijk Rijff. and I supplied the photos, including the Moss print. And this is (again) an excellent read – thanks!! Some historic pieces, great subject again Bob. Superb Article & Work – Preserving History !! Elvis in the 50´s … I can never get enough of this period, when he was lookin so COOL and he made his BEST music. 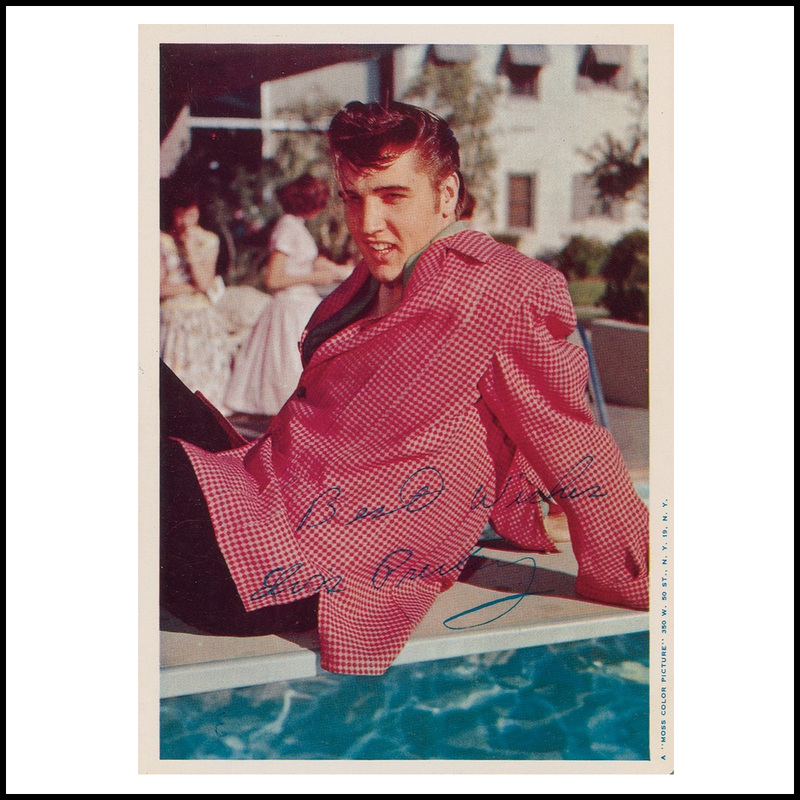 Keep it up Bob and Ger and thx again for this very cool and informative Elvis-site!! It doesn’t get any better on this subject. Here we have it all, lay out in front of us. The most informative website around !